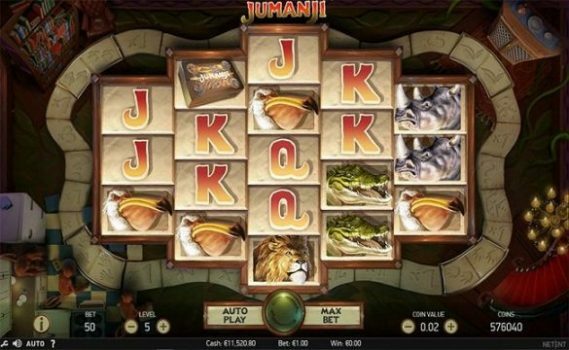 Jumanji is the newest online slot from the makers of NetEnt software for which reels are 5 and paylines are 36. It is one of the most popular video slot game these days which offers a huge jackpot coins to the players. Total number of coin for the game is 10 and you can play Jumanji slot with the help of your mobile phones or desktop at any NetEnt online casino for real money with coin sizes of 10p per spin to up to £200 per spin. Jumanji slot is based on a blockbuster Jumanji movie released back in 1995. The visuals, graphics, playing environment as well as background sound of this slot game are simply awesome. You will feel like everything you are checking out in this game is happening just in front of you. This is an adventurous slot game from the house of NetEnt software. There are 9 bonus rounds available in this game. The free spin feature will offer you 5 to 10 free spins and up to 1x of multiplier on your total bet. Return of player percentage for this slot machine is over 96%, which simply shows its credibility and popularity among slot lovers. The game offers a jackpot of 140 times of your total stake. You can trigger 4 game features during base game which will give you re-spins, wild reels, and symbol shuffles as well as up to 9 wilds. This slot is like a board game, where you will roll the dice and winning combination offer you cash prizes. You can win extra rolls as well and could get up to 4 bonus feature that will yield free spins during the base game. There is a Mystery feature available in this game which will give you access to any of the 4 main bonus feature as well as cash prizes. This game is set in the jungle where reels 3, 4, 5 and 3 symbols are played higher. The reels of the game includes symbols like A, K,Q and j of playing cards. You will also find symbols like lions, pelicans, crocodiles and rhinoceroses in this game reels. If you hit the 5 latter across a payline, you would receive 14 times of your total stake. The 4 bonus features available in Jumanji slot during the base game are Sticky Vines feature, Monsoon Wilds feature, Monkey Mayhem feature and Wild Stampede feature. The Sticky Vines feature will award you re-spins. In this feature all the symbols of winning combination will stick and rest of the symbols will respin and that means you will have a great chance to win cash prizes. The Monsoon Wilds feature will be triggered when reel 1 or 2 becomes wild reels. The Monkey Mayhem feature will offer you guaranteed winning combinations, while in the Wild Stampede feature the rhinos will stampede the reels and then 4 to 9 symbols will turn in to wild symbols. There is a scatter symbol in this game which will offer you free spins. The Jumanji board game is the scatter symbol and if you hit 3 of these symbols on active reels you will be offered 6 free spins (dice rolls), 4 of the scatter symbols will offer you 7 dice rolls for free and 5 scatters will give you 8 dice rolls for free. Jumanji slot game is definitely one of the best slot game these days you should check out.